I think in the last month, I’ve seen more than a few articles discussing the lack of play in a child’s education. Play is a big part of my music classes, even with my oldest students. I incorporate play parties, adaptations of playground games, and imaginative play into the curriculum to really let my students have a chance to move and had fun. My Preschool and Kindergarten students love imagination play. For example, last week, after my duck puppet, Peanut, demonstrated loud and soft while listening to Haydn’s Surprise Symphony, he jumped up from his nap every time the music got louder. Then the students took their turn, pretending they were the music fans who had fallen asleep. Jumping up from their ‘naps’ was so exciting for them! The idea that they got to pretend to sleep during school was fun. Our creative movement often involves moving while carrying something or moving through something. The last few weeks we have been singing a folk song called Aiken Drum (his hair is made of spaghetti!) Next week when I see them, we will have to move through spaghetti! Scripting Your Story – Catch Their Imagination! ​My stories get very elaborate. First grade is currently trying to find a bear. We’ve been on a train, off the train, back on the train, stopped at an apple orchard, and kept getting distracted by all of these other animals. So far, we went into the town where the man will tell us how to find the bear, but we haven’t seen him yet because we were stopped by the cobbler, and then the town was in a tizzy because Miss White saw a ghost. This summer I took my Kodály Level One with Joy Nelson and she really recommended scripting your Kindergarten lessons to tell a story. In other words, write down everything you are going to say throughout the whole class such as transitions, directions, explanations, etc. I though it would be really a great way to transition kids into 1st grade by keeping those scripted lessons. This imaginative scripting has been a bit of a surprise to me. It’s interesting how my first graders have become so wrapped up in finding that bear. They love imagining the places we have been, and have even described the view to me! It’s really helped them connect to our folk songs. The concept of a play party was new to me when I started delving into Kodály. Essentially, they are singing games that came out of finding a way around strict religious mandates on dancing. They were choreographed movements that took on the qualities of kids games because dance movements were banned. One of my new favorite play party games is The Jolly Miller. I’ve learned the version in the Sail Away book, but a variation is found in the Holy Names Kodály collection. The version I use is not specific gents vs ladies. I had always just called these activities games. The best part about a play party, is that your ‘I don’t dance’ kids still get up and move. Students at one of my schools had a history of not singing, not dancing, and not moving to music. But a more traditional middle school curriculum was exhausting for all of us since I only saw them once a week. This year, I’ve adapted a Kodály approach with them doing a mix of songs for older beginners, and ones with more difficult concepts. They have all been singing, dancing, and moving to music without thinking about it. And for the first time, concepts are coming much more easily to them. Most of the song choices I’ve made for them have fallen into the category of play party. Creating that comfortable environment has been more than half the battle, and now that it exists, we are getting ready to try our hand at dancing. Teaching using a spiral curriculum instead of straight-line has been helpful for me as well. I am able to cover many concepts I feel they were not solid in understanding as well as I wanted them to. This picture is from one of my favorites: Shoo Fly! First graders love trying to turn their circle inside out! One of my favorite games, is an adaptation of the playground game Four Corners. A few years ago, I had a mixed age classroom (1st to 5th grade together). The kids constantly begged to play the playground game in class, so I found a musical twist to it. When I started, I hand wrote rhythms for kids, but I was able to easily differentiate and put out rhythms for each grade. Now I have rhythm sets as well as instrumental games that I’ve made that my students still beg to play weekly. It is played very similar to the playground game. Students have 10 seconds to get to a corner while the person in the center closes their eyes. The person in the middle selects a corner without looking and those people are automatically out. Then the students in the remaining three corners must correctly read the rhythm from the card they select to get the right to leave their corner. If they get stuck, the person in the middle knows they can call them out, and usually does! The final person standing become the new person in the center. 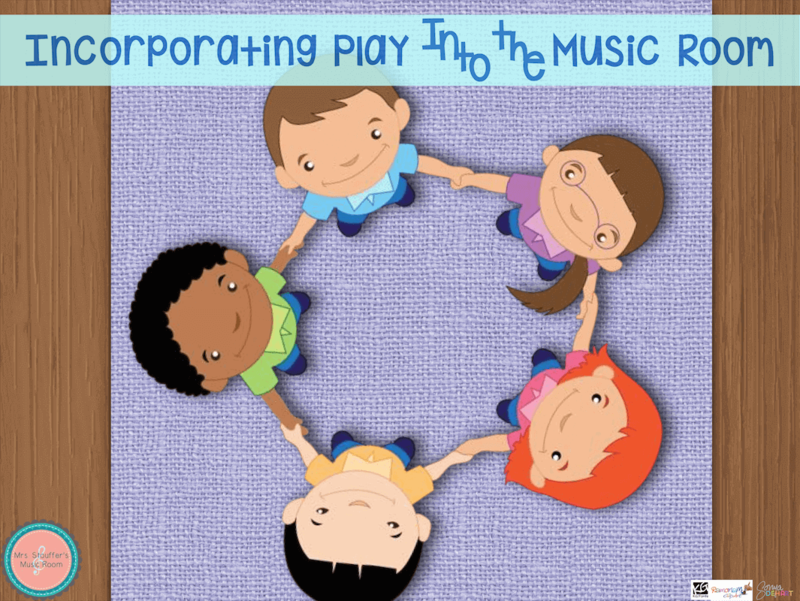 What ways do you incorporate play and imagination into your music classes?